Throughout gold rush and gold mining history, the discovery of a large gold nugget is a phenomenon which always causes excitement throughout a mining community as well as capturing the wider public's imagination. It has probably something to do with so much gold being found at the same time, often with relative ease. Gold nuggets can be found in alluvial deposits (sediments formed by water movement) or in other placer deposits (formed by other movement), but gold nuggets can also be found in or close to primary gold deposits, for example gold lodes or veins which have been exposed by the weather. "Gold nuggets" can also technically be extracted from hard rock gold deposits as long as the surrounding rock can be removed. 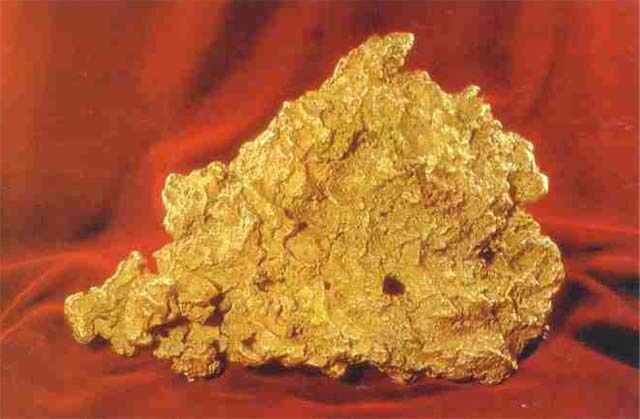 There are a number of gold nuggets which claim to be the world's largest. Obviously, not all of these claims can be true. There are also a number of "largest gold nuggets" lists which confusingly mix historical nuggets which no longer exist alongside nuggets which still exist. We think a list of gold nuggets which still exist is more accurate, since many historical nuggets are now just legends and have long since been melted down into gold bars or gold coins. Therefore, the following list, based on research to the best of our abilities, profiles the largest 'named' gold nuggets which are still in one piece, all of which are famous, all of which are on display, and all of which can be visited by the public. 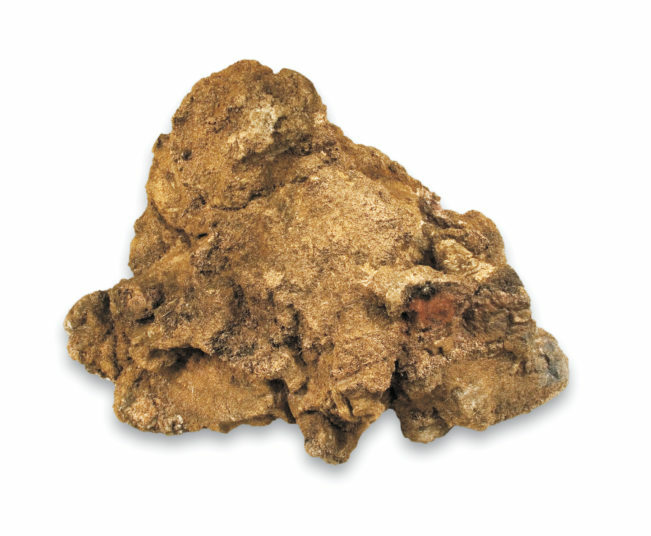 The world’s largest surviving gold nugget is the Pepita Canaã (Canaan Nugget) which was found by miner Júlio de Deus Filho in the Serra Pelada ('Naked Mountain') gold mining region of Brazilian state of Pará in 1983. The Pepita Canaã gold nugget has a gross weight of 60.82 kgs and contains 52.33 kgs of gold, or 1682 troy ounces of gold. 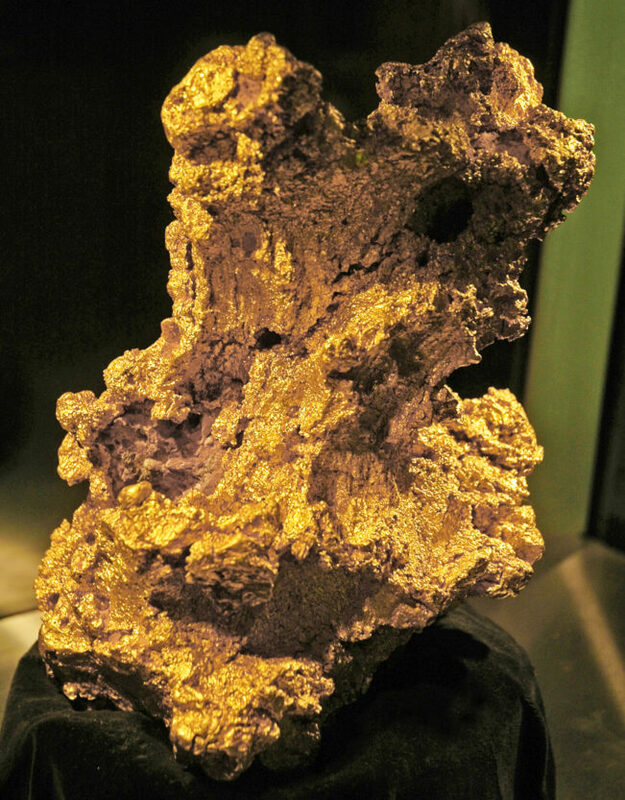 The "Canaan" gold nugget was purchased by the Banco Central do Brazil in 1984, and is now on display in the "Gold Room" of the central bank’s money museum (Museu de Valores do Banco Central in Brazil) in Brazil’s federal capital Brasilia. 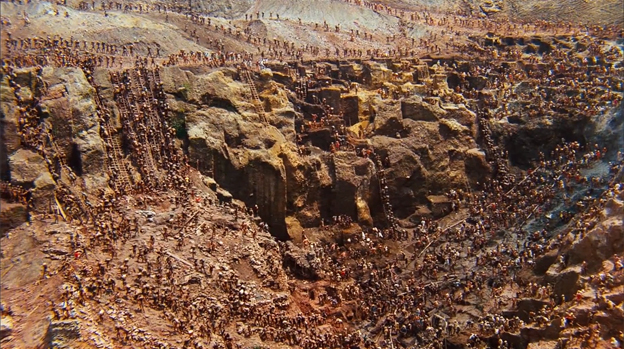 In the early 1980s, Serra Pelada became known as one of the world's most notorious gold mining areas when over 100,000 freelance miners flocked there to engage in open air gold mining excavations in vast, dangerous, and crowded conditions. The Serra Pelada has essentially been closed since the late 1980s and gold mining is no longer possible due to flooding and government prohibitions. However, Brazil is still a significant gold producer, with gold production output in 2016 totalling 80 tonnes, according to the US Geological Survey (USGS). The world’s second largest surviving gold nugget is the “Great Triangle”. This gold nugget was found in the Miass area of the Russian Urals mountains in 1842 by Nikofor Syutkin. It has a gross weight of 36.2 kgs and a gold assay of 91%, meaning that it has a fine gold content of 32.94 kgs, or 1059 troy ounces of gold. The "Great Triangle" has dimensions of 31 cms * 27.5 cms * 8 cms, and as the name suggests, it is triangular in shape. When found, it was dug up from a depth of about 3.5 metres. The Great Triangle gold nugget is owned by the Russian State, and through the Gokhran Fund (State Fund for Precious Stones and Precious Metals), it is currently on display in the 'Diamond Fund' collection in the Kremlin in Moscow. The Diamond Fund is an extensive permanent exhibition of the Russian state's crown jewels, precious stones and gold and platinum nuggets. The "Hand of Faith" is a 27.66 kgs gold nugget found by in the area of Kingower, Victoria, Australia in 1980 by a local, Kevin Hillier. This gold nugget has the distinction of being the largest gold nugget ever found using a metal detector. It contains 875 troy ounces of gold, and has dimensions of 47 cms * 20 cms * 9 cms. 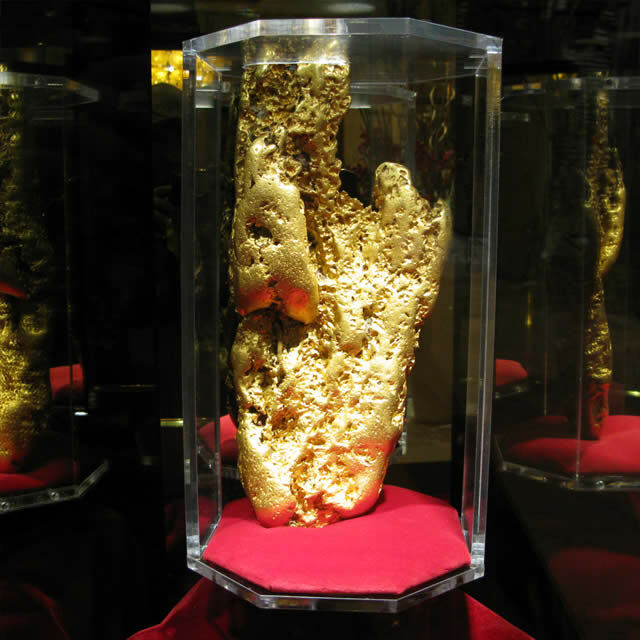 The "Hand of Faith" nugget was purchased by the Golden Nugget Casino in Las Vegas, Nevada, USA, and is currently on display in the casino lobby on East Fremont Street in the old downtown center of Las Vegas. 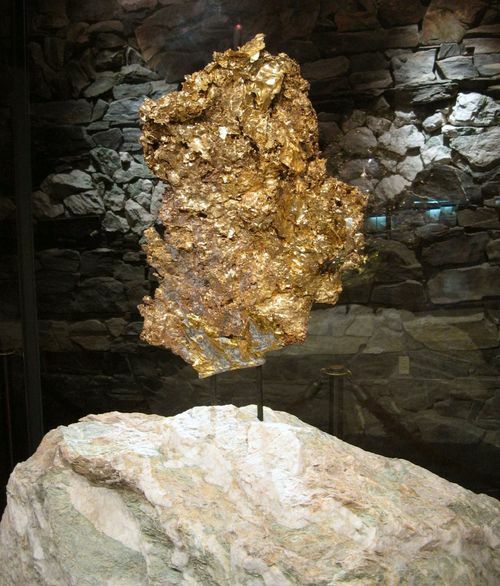 The "Normandy Nugget” is the name given to a 25.5 kgs (820 ozs) gold nugget found is 1995 in the important gold mining centre of Kalgoorie, Western Australia. Assay analysis shows the Normandy Nugget to have a gold purity of between 80% and 90% . According to the US Geological Survey, Australia is the world's second largest gold producer, with gold mine output of 270 tonnes in 2016. Gold and California have been interlinked since the famous northern California gold rush of the late 1840s – early 1850s. The US is still a major gold producer, and in 2016 produced an estimated 209 tonnes of gold according to US Geological Surveys (USGS), putting it in fourth place behind, Chine, Australia and Russia. Nowadays however, Nevada and Alaska are the US' two primary gold producing states, although there are still gold mining operations in California such as New Gold's Mesquite gold mine. There are actually a number of gold nuggets from Brazil's Serra Pelada region on display in the Brazilian central bank's museum. A list of these gold nuggets can be seen here. Three of these additional gold nuggets are listed with gold content weights of 30.56 kgs, 29.89 kgs, and 28.2 kgs, respectively, which would make them larger than both the 'Hand of Faith' nugget and the 'Normandy Nugget'. However, none of these other Brazilian gold nuggets has received fame in the same way as the Pepita Canaã nugget, and the Banco Central do Brasil seems to prefer to display them anonymously. Technically these other Brazilian gold nuggets from Serra Pelada would push both the Australian nuggets and the Ironstone nugget down the list. Two historic gold nuggets found in Victoria, Australia in the 1800s were both larger than the Brazilian Pepita Canaã nugget, and both at times still appear in "world's largest gold nugget lists". The first of these was "The Welcome" nugget found in Ballarat in 1858 during the Victoria gold rush. This gold nugget weighed approximately 69.98 kgs. However, "The Welcome" was subsequently shipped to England and melted down by the Royal Mint in 1859 to fabricate Gold Sovereign coins. Replicas of "The Welcome" can still be seen today in a number of Australian museums.